Leif G W Persson (1945-) is an eminent criminologist with a doctorate in criminology from the University of Stockholm (1980) and a long career as a crime expert and a psychological profiler in Swedish academia, police and media. His parallel career as a crime novelist started in 1978 with Girsfesten (The Pig Party). Persson has won the prize for the best Swedish crime novel three times: 1983 for Samhällsbararna (The Pillars of Society), 2003 for En annan tid, ett annat liv (Another Time, Another Life) and 2010 for Den döende detektiven (The Dying Detective). He won the Glass key for the best Scandinavian crime novel in 2012 also for Den döende detektiven. He Who Kills the Dragon (orig. 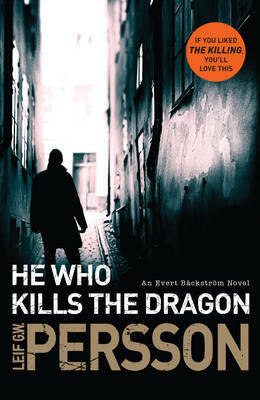 Den som dödar draken) is the second Evert Bäckström novel. The first was Linda – as In the Linda Murder (orig. Linda - som i Lindamordet in 2005) and there is a third one, published in Sweden 2013, called Den sanna historien om Pinocchios näsa (The True Story of Pinocchio’s Nose). There is discipline and subtlety in the plotting. The novel opens with the crime scene and the investigation progresses in widening circles while keeping the murder firmly in the centre. Persson uses well the method of moving the narrative forward by re-interpreting the same clues in different ways. The pace of the narrative is slow and the investigation progresses through a series of team meetings where police officers report on their work (28, 70, 80, 106, 198, 343). There is only one small instance which disturbs the smooth and confident plot: we see Bäckström settle down to hear a critical piece of information from Halfy Söderman, but we are not told what it is. It is an awkward moment in a narrative which otherwise keeps the reader abreast with Bäckström’s investigation. There is also discipline and subtlety in Persson’s description of the Swedish society, “our glorious socialist paradise” (57). The murder victim is an old Swedish man, with old Swedish cronies. The murder, at least at first appears to be “the tragic story of the most common murder victim in Swedish criminal history,” (7, also 8) “A purely routine case” (10): “One pisshead has been murdered by another pisshead.” (39) Karl Danielsson, 68, has been battered to death and strangled in his flat after a night of drinking. The initial interpretation of the murder is as a traditional, genuinely Swedish kind of murder. The police team investigating the murder is multi-national and multi-ethnic. There are foreign witnesses and suspects. There is a carefully built contrast and intermingling of the old Sweden and the new Sweden. While a Polish builder waits to return “back to civilization back home in Poland,” (41) he warns the Swedes: “Don’t curse the paradise that you Swedes actually live in, because it might be taken away from you” (42). Paradise Sweden certainly is, but whether it is a civilization is another matter. And there is discipline and subtlety in Persson’s depiction of the police force. The investigative team is large and each police officer gets her or his backstory and individual character. On the back cover blurb there is quote from Barry Forshaw: “Bäckström is a character worthy of Joseph Wambaugh at his best …” Rather than Bäckström, what reminds me of such Wambaugh novels as Hollywood Station (2006) is the carefully managed cast of police characters who all contribute to the investigation. In Persson’s novel, too, the various characters have differing ideas about the crime and sometimes not very good opinions of each other (339). This leaves the reader to decide, which characters are most likely to figure things out and which ones simply cannot be trusted. It makes the narrative more engaging. But there is very little discipline and subtlety in main joke of the narrative: Detective Superintendent Evert Bäckström. We meet Bäckström as he is “voluntarily sober for the first time in his adult life” (18). Within twenty pages he is established as a rude, bad-tempered, alcoholic slob. He lies (89, 161, 183, 188, 302, 312), he deceives (159), he is two-faced (52, 70, 81). He is male-chauvinist (20, 24, 84, 232, 280), he is racist (25, 55, 182, 185, 301, 375), he is homophobic (240, 241, 350). Bäckström has an inflated image of himself both in terms if of his intellectual superiority (28, 68, 106, 137, 152, 213, 215) and his physical attractiveness. (244, 280, 312) He refers to his “super-salami” on several occasions (85, 234, 243, 266, 352). Persson places Bäckström carefully on the borderline of grandiose self-delusion and amoral, opportunistic selfishness. The reader is left to decide whether he is a tragic character or just a total twit. This is a good achievement. In Bäckström’s past, there is the shadow of Palme’s murder (123, 131), there is no getting away from this pivotal moment in the history of modern Swedish society and its police. Persson has drawn a direct link from it to the character of Bäckström (135). (There are also references to the murder of Anna Lindh  and war-time collaborations with the Germans ). Bäckström is a product of the Swedish society. It is clear that while Bäckström’s prejudiced views are shared by a few other characters, they are not shared by the third person narrator. The Somali postman Septimus Akofeli, the Polish migrant worker Jerzy Sarniecki and the police officers of diverse ethnic backgrounds are presented with sympathy. Although there is an ironic suggestion that Bäckström could replace Leif G. W. Persson (Alm to Bäckström: “maybe you could … replace that tired old professor on the National Police Board, that Persson bloke” ) , the solution to the crime suggests that Bäckström’s prejudices are not shared by the author either; the motivation for Danielsson’s murder is another sarcastic twist in the tale but can also be read as a comment on our current political and cultural prejudices. Persson’s decision to make his detective hero a thoroughly unpleasant character is not only a source of humour, it also raises some interesting considerations about the reader’s expectations. We want Bäckström to redeem himself. We read in the hope of coming across some action, even some thought or feeling of Bäckström’s, by which we could reconcile ourselves to his unmitigated horridness. We want our hope in the detective to be restored. Instead Persson gives us a different picture of the state of the detective hero: just consider what happens to the fortune discovered in the safety deposit box. This part of the narrative does not work so well, because by around page hundred we grow tired of Bäckström’s misanthropy (112, 116, 119). There are only so many times we need to hear about his racial and sexist prejudices. The overabundance of Bäckström’s obnoxious thoughts and comments makes the reader feel like the same old joke is being repeated and the narrative is in danger of becoming as tedious as Bäckström himself. This is a stylistic fault in an otherwise good novel. Persson is an intelligent writer and one of the best contemporary crime writers, not just in Sweden, but anywhere. Despite its faults, there is much to appreciate in this story. Persson’s novel is both perceptive and intelligent in the way it presents a traditional Swedish crime investigated by a contemporary, diverse police force, and how both traditional ideas about Swedishness and contemporary concerns about crime and foreigners affect the investigation. The handling of the murder case and its solution would seem to suggest that it is not the foreigners that are the problem, quite the opposite. Quote apart from the cumbersome Evert Bäckström, there is some very black and subtle humour in the resolution of this excellent crime novel, with a clue in its very title.